The commercial framework contract for the construction of a third reactor at the Atucha plant in Argentina has been signed between Nucleoeléctrica Argentina and China National Nuclear Corporation (CNNC). Through the contract, the parties agree that Nucleoeléctrica, as the owner and architect engineer of the project, will conduct pre-project, design, construction, commissioning and operation of the new 800 MWe Candu 6 unit. Meanwhile, CNNC will provide technical support, services, equipment and instrumentation under a $2 billion long-term financing arrangement. In addition, China will also supply materials needed by Argentina to locally produce components for the unit. CNNC operates two Candu 6 units at its Qinshan plant in China's Zhejiang province, which will be the reference plant for the new Atucha unit. The framework contract also calls for the creation of five commissions - including one on funding - that will meet in Buenos Aires to develop around 12 specific contracts related to the new reactor. These should be signed during the first few months of next year. The signing of the framework contract for Atucha 3 follows that of a high-level agreement towards the unit's construction. That accord was signed in mid-July as part of a meeting in Buenos Aires between Chinese president Xi Jinping and Argentine president Cristina Fernandez de Kirchner. Nucleoeléctrica Argentina and CNNC signed two agreements in February covering operations and technology, as well as the use of Chinese goods and services in Argentine exports. Under the first of those agreements, Nucleoeléctrica and CNNC will cooperate on issues related to reactor pressure tubes, including engineering, fabrication, operation and maintenance. It also covers the manufacture and storage of nuclear fuel, licensing, life extension and technological advances. This agreement is aimed at both operating and future nuclear power plant projects. 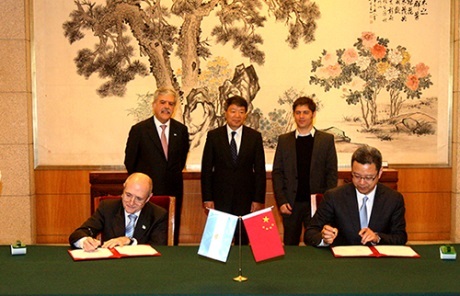 The second agreement calls for the transfer of Chinese technology to Argentina. Under the accord, Argentina could act as a technology platform, supplying third countries with nuclear technology incorporating Chinese goods and services.